The world's best players score well because they hit shorter clubs into the greens than you do. So why not join them, from a distance more suited to your game, instead of from the back-tee boxes, that just doesn't match up with your strengths and abilities. Golf is a game that can certainly be a challenge, but we play it because it is fun, and it is certainly more fun when we are playing better, scoring better, and taking fewer swings to complete our round. This initiative subscribes to the ideal that golf should be more fun for all levels of players, especially those who would benefit from a course that sets up a little shorter in distance. A 400-yard par 4 can be not just a challenge for some players, more so it can be an exercise in frustration, as shorter-hitters take several shots to advance the ball toward the green and perhaps a few more around the green leading to scores like 7 or above. Not only can this be frustrating, but it can also be intimidating and embarrassing if that player is in a group with more accomplished players. The solution? Play the 400-yard par 4 from a distance that matches your skill set. Imagine playing the same hole, but from 270 yards. A shorter hitter will be able to advance their ball onto the green in 2 or 3 shots and finish out with a score of 4 or 5. That is a game-changer, will definitely improve their enjoyment of the game, and will completely eliminate any feelings of intimidation or embarrassment. All of a sudden, the game is fun. The answer to the question of how long a course should be for you is really simple. It is 28. Just multiply the length of a well hit drive for you by 28 and that, is the length of a course that will be challenging but enjoyable to play. 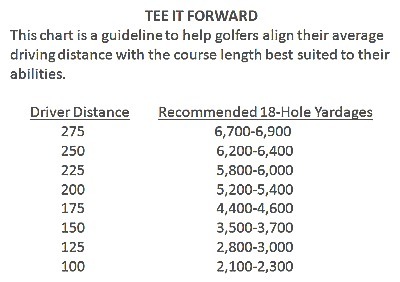 Here is a chart by the USGA that is their recommended course yardages in relationship to driving distances. A bit more than the 28 factor. Multiply your Driver distance by these: It’s amazingly, really close!!! Say your driving distance is 220 yds. An ideal course will have a combination of easy, moderately difficult, and difficult holes. Knowing the length of your drive, you can estimate how far you hit your other clubs. Using the ratios from above: The second shot into the green is calculated. If a short distance par 4 is a drive and a #8 iron, you know the length of an easy par four for you is 155% of the distance of your drive. For example, say you drive the ball 220 yards, therefore the ideal distance for an easy par four or 220 x 1.55 is 341 yards. If a medium distance par 4 is a drive and #6 iron, you know the length of a moderately distance par four for you is 164% of the distance of your drive. For example, say you drive the ball 220 yards, therefore the ideal distance for a moderately difficult par four is 220 x 1.64 or 360 yards. If a longer par four is a drive and a 7 wood or hybrids, you know the length of longer par four for you is 176% of the distance of your drive. 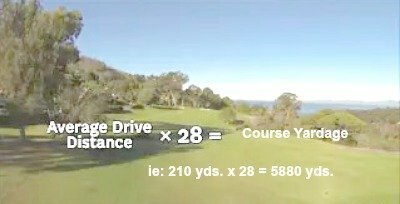 For example, say you drive the ball 220 yards, therefore for a difficult par four is 220 x 1.76 or 388 yards. Therefore: Long Par 4: 388 yards. You can use these ratios to calculate the ideal yardage for par fives and par threes. Drive: 220 yards Drive: 220 yds. Drive: 220 yds. 3 WD: .88% 194 yards 5 WD: .82% 180 yds. 7 wd: .76% 167 yds. 9 Iron:.50% 110 yards 9 Iron: .50% 110 yds. PW: .45% 100 yds. Total: 524 yards Total: 510 yds. Total: 487 yds. Medium: 6 iron: 140 yds. Short: 8 iron: 121 yds. Now, if you have a perfect day, and don’t miss a shot, (yeah right!) and only have two putts per green, (or that’s=36 per round). VOILA!! You have just shot par. Easier said than done EH!! CONCLUSION: Spend the time to not only get your driver swing speed, but most important of all KNOW HOW FAR EACH CLUB IN YOUR BAG GOES!!!! Of course, that’s only when you hit them perfectly. Using tee it forward as a new adventure on your re-designed golf course, go to our COMBINATION TEES page for a further look at what you can do to enjoy the wonderful world of GOLF YOUR WAY!